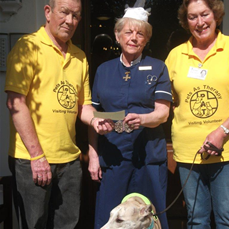 At the summer garden party this year we decided to raise money for Pets as Therapy (PAT’s) and with the generous support of our residents and their friends and family we managed to raise £134. This week the charity came in to see us and collect the cheque. They also brought with them a few of the dogs that work for the charity. We would also like to thank Luscombes at the Golden Ball, Waitrose and DMJ Ceramics for their Kind and generous donation of prizes for the raffle.